Meet Cici, who is now matriarch of our hoard. 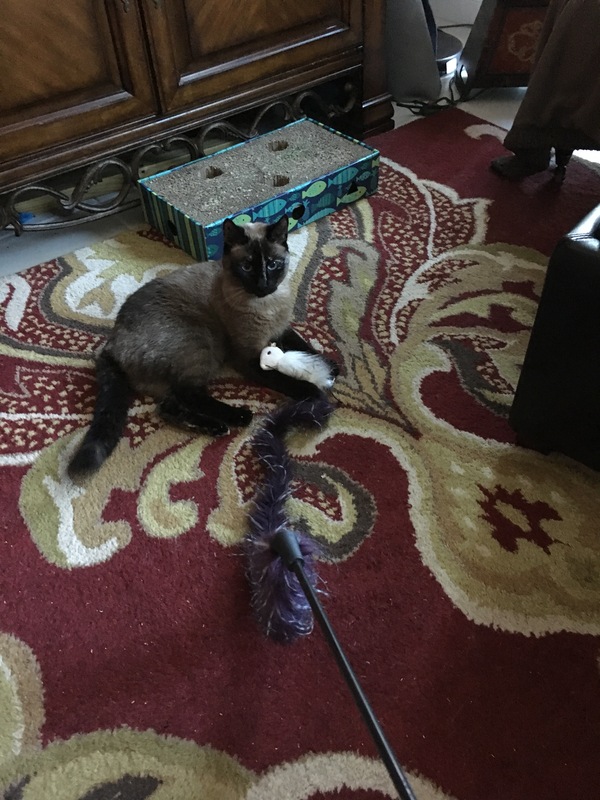 Cici is a 8 year old Siamese, tortoiseshell mix that we adopted when she was around 9 months old. More Siamese, as you might notice, with all the quirks of both. She is a street rescue who spent around 6 months in a kennel at my vets office. They thought she was too wild and didn’t know what to do with her. But within minutes of meeting her she had exposed her belly and was purring. In a kennel at the vets office. She’s always been quirky! This threw her into turmoil, which we were anticipating. What we didn’t anticipate was how bad it would be for her. The anxiety was so high that she was hiding and then she begun peeing in inappropriate places. We tried everything, calming sprays, adding litter boxes, to no avail. However, Prozac to the rescue and things normalized somewhat. Medicating her wasn’t an easy choice, but for her necessary. Then more life changes, we lost Peanut the year after we moved and then decided to adopt kittens, ending up with kittens as foster failures. LOL. We thought that maybe seeing kittens and observing normal cat behavior would help her. That kind of backfired because the kittens just picked up the worst of her habits! During this time I had the idea to give Cici a black tourmaline pendant. Which did help to ground Cici and start to tolerate the kittens. But then we lost Fiesta, who was almost 16 years old. We had no idea how much the loss of Fiesta would impact Cici. 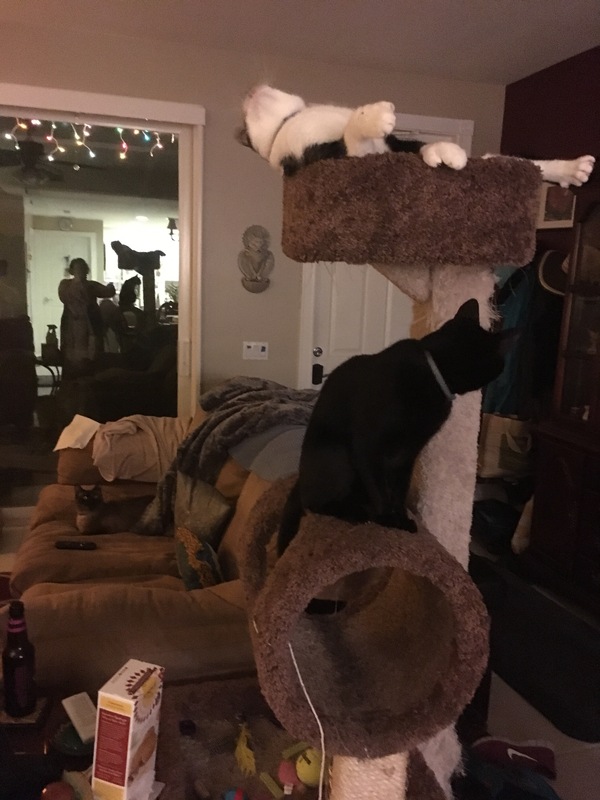 Her tolerance for the kittens went from barely tolerated to exactly zero. Even seeing one of the kittens would set her to hissing and growling, she’d hide under the bed all day if she could get under there. We added a sodalite pendant and saw further changes. We started site swapping with the cats, rotating access to rooms between her and the kittens. And the change in her was amazing. Her anxiety levels started to diminish. Not great, but better. She was hiding less and less and playing occasionally. Occasionally one of the stones would come loose from her collar. We’d recharge on selenite and then put it back. And then she lost both pendants on her collar. Knowing she was done with the work with these stones I knew it was time to up the game. Here’s collar 2.0. This was created with small tumbled stones and a hot glue gun. Yes the stones will fall off in time, but that’s the point. When she’s done with working with that stone, I’ll replace it with something else. And proof it is helping, here she is in the living room. Cici playing, yes she wants all the toys! And best of all, a picture I took the other night, her out during the chaos of the kittens playing. And while she dashed under the coffee table shortly after I snapped this picture, it shows how far she has come. And Remarkable that she’s watching the kittens play. She hid shortly after the pic, but hey, I’ll take it. Here’s the collar up close. I know, double collars, but she tolerates it well. We still have a lot of work to do, but we can see the light at the end of the tunnel. Just like anyone who lives with anxiety. There are good days and bad days, but we will roll with the punches. As long as there is love and patience. This is an easy project that can work with any one, cats, dogs, and humans! If you need help creating a custom collar for your pet, or put together a medicine pouch, just let us know. You can contact us below or visit our website. Mary and Jennifer co-own The Other Side of the Sun (TOSOTScrystals) an online crystal and mineral store. We are also Energy Workers, Licensed Massage Therapists and Estheticians. We have been working with the crystal world since 2001.